I flipping love a good pencil skirt, me. By far the most worn item in my wardrobe is a jersey double-knit black pencil skirt – bought from H&M for my 19th birthday. If I were to lose anything in my wardrobe, I’d probably be most upset about this – things you can just throw on in the morning for an early start at work really are priceless. Pencil skirts are one of those great wardrobe staples. But I can’t say I’ve yet made the “perfect” pencil skirt. Oh, but I have tried – even made one of those wearable muslin things. 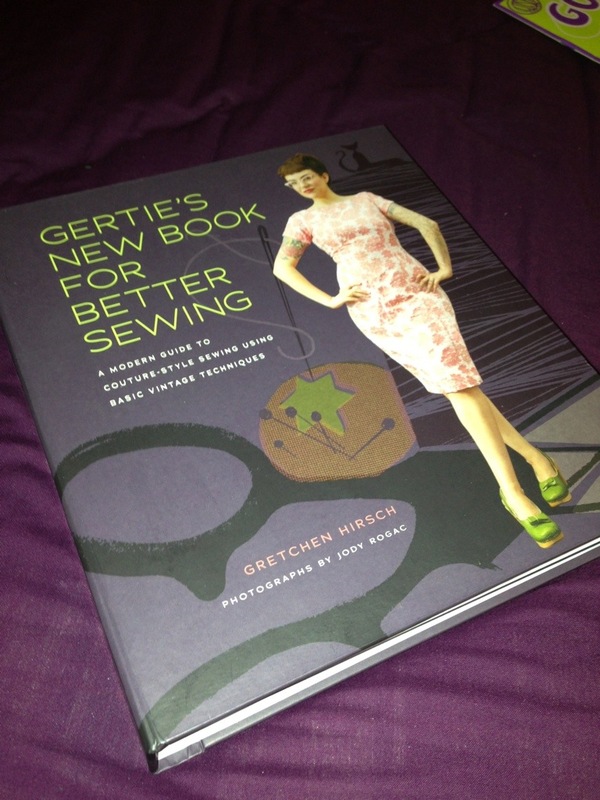 As a little treat to myself, I bought Gertie’s New Book For Better Sewing, which has reams of glorious patterns plus plenty of room for alterations. I traced out the pencil skirt pattern last night with every intention of cutting the cheap-ish floral poplin I’d bought for a wearable muslin. But, to date, I haven’t had the best of luck when it comes to pencil skirts. They may be my favourite item to wear, but not to make – odd, really, as you would have thought two straight seams and a few darts make for some easy-peasy sewing. But get some measurements slightly off and you can end up with the dreaded wrinkles, which just ruin the whole effect if you ask me. So, before trying what will be my third pencil skirt pattern in recent years, I’ve decided to put the breaks on and maybe, actually, do a PROPER muslin this time. As in, one I will take apart and keep for future pencil skirtness. For one thing, in Gertie’s book, the patterns are adjusted to take into account that most women are bigger size in the hips than they are in the waist. Not me! But if I nail this with a decent muslin, then there’s nothing stopping me from creating pencil skirts in every colour of the rainbow… not to mention the other garments which build upon the foundation of this skirt block in the book. So that was a very roundabout way of saying that I had planned to sew loads tonight, but actually, I’ve decided to put the brakes on. Thats a great skirt up the top of this post! I look forward to seeing your Gertie skirt! Well I was supposed to sew some birthday gift boxers but I watched an episode of the Waltons and 2 episodes of Psych. I didn’t even do any planning like you did, so hats off to you, well done! Maybe if your favorite skirt is made of double knit you should try to replicate it with a stable knit fabric? Good luck! Good luck on this noble project! I do have hips and the pencil skirt from gerties book fitted me fabulously. I did have to grade one size or two in the hips, as I usually do. So maybe you don’t need to worry too much? That’s interesting. Hopefully not, but we’ll see when I get the muslin done. I’m with Molly– buy a nice double knit and do a rub-off of that skirt pattern! With you on the waist/hip thing!